I believe that you cannot succeed in business unless you align your business goals with your life’s purpose. Starting a business is likely to be much more work than you previously experienced in a paid job. The only way you can succeed while also staying sane is by aiming to achieve something that is meaningful to you. It is true that a business needs to make money. But many entrepreneurs are too focussed on the question whether a business idea can make money. In their enthusiasm to discover their idea has the potential to do so, they forget to ask themselves if this is the way they want to make money. Finding a business idea that can make money is easy. Just google “business idea” and you will find 47 million pages. That’s pretty exhaustive. If you are still reading, I guess you know this isn’t the best way to come up with a sustainable business idea. You may recall from your previous work experience the feeling of dissatisfaction when you are involved in activities, 8 hours a day, 5 days a week, that don’t fully resonate with you. Even a moderately successful career can make you feel like “there must be more to life than this”. When your daily job makes you miserable, depressed even, you cannot function at your best. You may accept your salary as compensation. But deep down you know it is not the money that provides motivation to do your best and it doesn’t make you happy. A wealth of research in positive psychology suggests that happiness and meaning strongly correlate with each other. The more meaning we find in life, the happier we feel. And the happier we feel, the more encouraged we are to pursue higher goals towards our life’s purpose. This is true for businesses too; your startup needs a purpose. If you want to create the best work you can and reach your full potential, you need activities that serve your purpose. Being happy while you work doesn’t just feel good it also makes you productive. That’s because happiness is the state of being where you don’t want to be in another state. When you are happy you are not restless, you are not distracted; you don’t have the desire to be doing something else. You are completely involved in your direct experience. Happiness can unleash creativity and sometimes moves us into a state of flow. In flow, what you think and do is self-perpetuating. Ideas come to you, you don’t make them happen. You can become so immersed in an activity that time seems to fly by. You forget about the possibility of failure and the worry about the competition and do the best work possible. When your work is part of your life-vision you move in the right direction. Obstacles can be overcome through repeated attempts. It becomes worth to make sacrifices and accept the pain that inevitably comes with wanting an amazing outcome because you come closer to fulfilling your life’s ambitions. If you want to create a business today (not 20 years ago), you have to stand out in a noisy, distracted world. The only way in which you can do that is by connecting with people. You need to communicate our ideas and purpose clearly before you can attempt to make any sales. Sometimes this world feels like everyone is shouting and nobody is listening. And the only way to cut through the clutter is by giving people what they need. When you give people what they need, they start to like and trust you. And when they do, they are much more likely to buy your product or services. There is no need to shout about it. But you have to pay it forward. The act of giving builds the relationships your business needs. There are many ways of giving people what they need. A simple solution to giving things for free without bankrupting yourself is by giving away knowledge. If you can wrap up your knowledge in the form of blog posts that are useful, applicable and memorable, you have the magic key to your customers’ attention. Without having your customer’s attention you cannot sell them. 20 years ago people started their businesses differently. Companies then relied on money to buy advertisement space and with it attention. Generally, the company with the most money could buy the most attention and achieved the highest sales almost regardless of their product offer. But the Internet has changed our world; money no longer matters. Honesty, authenticity and integrity are the currency of today. You only need to check out the VW share price before and after the emission scandal erupted to see the heavy price companies have to pay for their dishonesty. But the truth about starting a business with little money is that it is very hard in the beginning. The process of getting such a business off the ground takes a long time and lot of effort. I believe it would be unwise to put yourself through the pain with no clear purpose, without a good reason for doing it. When you start up your own business, you have a great opportunity to get the most important aspect of your business right: you can start with something you truly feel is worth doing. Something you would enjoy doing even if you had to do it for free indefinitely. From a basic financial perspective, your customers are the most important group of people you want to build a relationship with. But apart from that you also want to build relationships with like-minded people that share the same visions, passions and calling. Business is not all about selling stuff; it is all about connecting with people to serve a purpose or solve a problem. Understanding your purpose allows you to have genuine interactions with other people. Quality connections matter to your business. They may open doors for collaboration. They may lead to opportunities you would otherwise not encounter. The better you understand your true calling the easier it will be to seek out the types of engagements that are rewarding. As a teenager, I was obsessed with cringe-worthy personality tests in magazines, like “What does your BLANK say about you?” As I grew up, I realised that these tests were telling me nothing about myself I didn’t already know. Funnily these days I feel the same about articles that suggest they can tell you how to find your business purpose. What did you enjoy doing as a child? What would you do if money was no obstacle? If you could be anyone, who would you be? Now if you have never thought about these questions, they may give you some insights. It certainly doesn’t do any harm to brainstorm. But if you are like me, you may find these questions irrelevant (as a child I liked climbing trees), slightly uncomfortable (legacy sounds so intimidating), and downright useless (Who would I want to be? I don’t know. I want to be me.). Luckily there are a few great thinkers that have grappled with the idea of the life purpose. They also have explanations for why we are finding it so difficult to find our true calling. First up Sir Ken Robinson, professor emeritus at the University of Warwick, UK. You know the phrase “He was in his element”? It is a phrase that puzzled Ken Robinson and he made it his mission to find out what the mystical element is that some people are born into. To answer his question, he examined the lives of many highly successful people from all backgrounds amongst them Paul McCartney, 'Simpsons' creator Matt Groening, physicist Richard Feynman and the gymnast Bart Conner. He concluded that the element is at the intersection of aptitude (what you are naturally good at) and passion (what you love doing). You can read all about Ken’s discoveries in his excellent book: “The Element: How Finding Your Passion Changes Everything”. Interestingly, once he discovered what the element was, he realised that understanding it is fairly easy. But for people to discover their element is much harder. He therefore wrote another book, a practical guide that helps people to find their own element. “Finding Your Element: How To Discover Your Talents and Passions and Transform Your Life”. You may wonder: why should it be so hard to find what we are good at? Ken Robinson suggests that our talents are often hidden deeply. That’s partly to do with our desire to protect ourselves from the opinion of others (What will they think?). And it has also to do with schools. Ken is a stark critic of schools who he thinks define desired aptitudes too narrowly and marginalise talents that don’t lead to academic achievement. 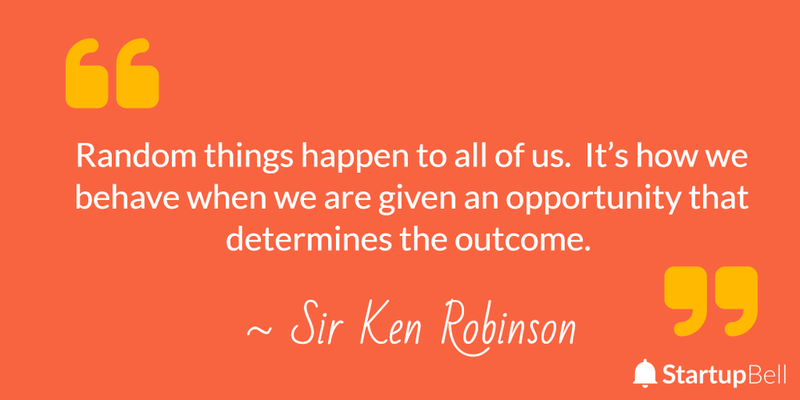 Happiness according to Ken comes about through 3 factors: biology, circumstances and behaviour. According to him if you find your element you find happiness. To help you find your element you have to embrace, or better create opportunities to live the life you want. To find your purpose, you must enjoy the journey. Too many people fall into the trap of imagining the outcome and how they would enjoy that. But according to Ken only the people that are so in love with the process of perfecting their talent actually reach the highs of being in their element. He says the journey is not a trip from here to there, instead it is a quest: the outcome is unknown. First, you need to understand that you cannot do what you are not born to do. Your genes will predispose you to be sporty or musical or mathematically gifted or whatever. (Helpfully Ken also suggests that our combinations of talents are as diverse as our fingerprints, so don’t give up if your talents don’t fall into one of the obvious categories.) Next, you need to see if you love doing what you are naturally good at. He says: if you don’t know what you can do you don’t know what you can be. Ken also has some enlightened thoughts on changing the world. He says we live in two worlds: one which exists regardless of you, the world with all the things in it. And then there is a second world: that’s the world that exists because of you. It’s the world seen through your eyes, with the filters of your perception, your experiences, your values and beliefs. In order to find your purpose, you have to want to change that world, the second world. You have to want to practice and improve for the sheer hell of it. Phew, it looks like big legacy thoughts are not required. Just as a side note neither Paul McCartney nor his music teacher thought he had any special musical talents before he left school. Walt Disney was told he lacked imagination. And Albert Einstein’s teacher told him he would never amount to anything. Martha Beck is Harvard Ph.D. with the most high-quality books on finding purpose and creating the life you want. Here is what I consider her best thoughts on finding your purpose. She says there are two parts to the human psyche: the essential self and the social self. Both are good and natural. The essential self is who you are born to be genetically. It seems for each of us there is an inclination to be better at some things than others. It might be sportiness or an artistic talent. It may be the ability to pick up languages or solve complicated maths equations. We all have talents we were born with. The social self, the second part of our psyche, is there to please others and to fit in. Our brains have evolved to be part of a tribe, without the tribe we would have died when we were early humans. Our dependence on the social self is the most important reason why we get confused when we are looking for our true calling. We look for others to guide us, but only our essential self knows what a meaningful life looks like to us. Ideally, you need to find what makes you happy and don’t deviate from that. Your happiness is your compass, your charts, your true North Star. 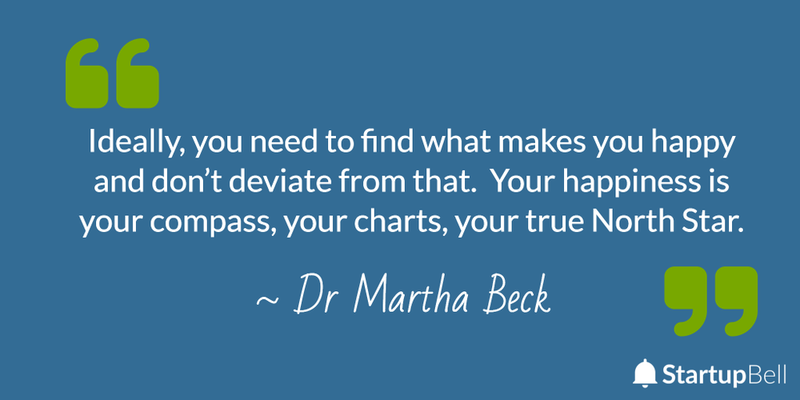 Martha Beck suggests that your body can help you find what you are meant to do, if you are observant. Take a few minutes to do this exercise. Think of something you absolutely love to and scan your body. What does your body do? Do you feel yourself smiling; taking a deep breath, do you get a flutter in your stomach? Now think of something you hate to do. What does your body feel like now? Do your hands tense, do your eyebrows frown, does your stomach turn into a knot? Thinking of positive activities and negative ones while observing your body teaches you to recognise you how your body reacts. Now write a list of all the things you need to do today and observe your body. It will point you towards what you like to do. Martha suggests you try to take steps every day towards doing the things we enjoy to live a happier and more fulfilled life. I think you can easily adopt the body scan technique to examine your business idea. How do you really feel about it? Seth says there are two worlds, the internal and the external worlds. The external world is the one full of technology that allows us to do exactly what we want. But the internal world says: now is not the right time, this is not the right idea. And it's an excuse. The right time is now. The present has always been the best time to start something. 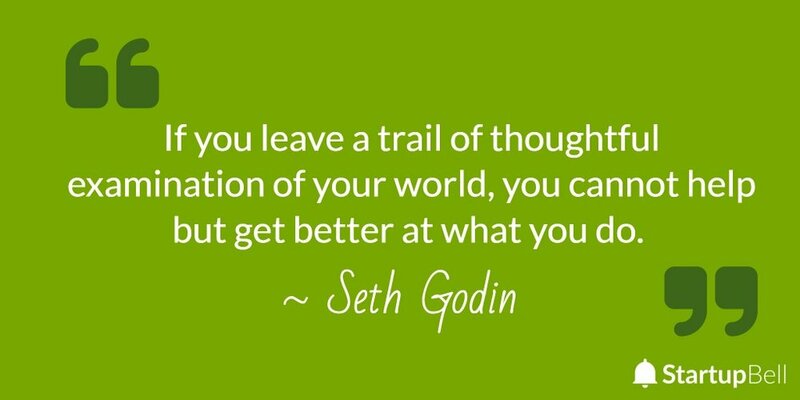 According to Seth, it is better to start something wrong than to start nothing. Sooner or later you will stumble into something that gets you somewhere. Seth says the reason people don’t start is that they fear being judged. His solution to overcoming the fear is to think of life as a game and to not take losing personally. If you fail, you can try again. There are 7 billion other players in the game that all want to win. The more you play the better you get at the game. And one day the dice may roll in your favour and you land on a really good square and you win. On the subject of purpose Seth says, the purpose should be to lead and to solve interesting questions. It should be in the spirit of doing something good for somebody else. You need to understand that when you start a business or make a big change in your business, you are starting a project that requires commitment for 5 or 7 years of your life. Ask yourself: Is it the right thing to do? If yes, get on with it and grow into your body of work as you do it. I picked out three experts that talked about purpose. All three highlighted similar points, which I personally find significant. We can only find our purpose by looking inside ourselves. But our purpose should ultimately not be selfish, but serve others or improve the world for all of us. Fear of being judged is real and may be the biggest hurdle to overcome to find our talents. You can’t just envisage what you want to become, you have to commit to the process and embrace it. Choose what you want to do and get started. You cannot think your way to success; you have to do stuff to get there. I hope this article helped you to get some clarity on what your purpose is and that it is not easy for most people to find. I also tried to put into context why your purpose or life vision needs to be aligned with your business. I hope you enjoyed the read. If you did, please leave me a comment in the section below.